A DISPUTE between Siyakhula Sonke Empowerment Corporation (SSC), a black-owned company that wants to buy the gold mining assets of Vantage Goldfields out of business rescue, and the company’s business rescue practitioner (BRP) continues to rattle on. 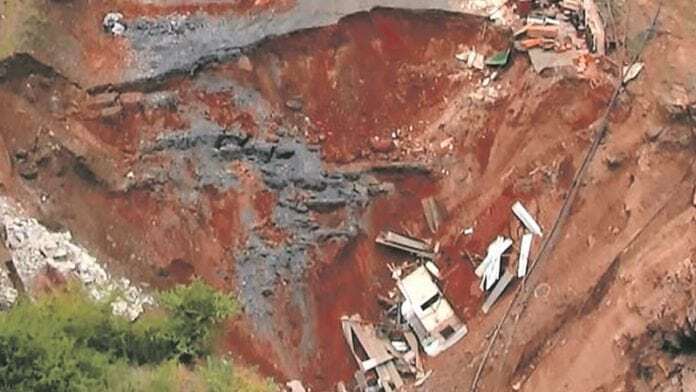 Vantage Goldfields owns the Barbrook and Lily mines, the latter the scene of a disaster in February 2016 in which ground collapsed fatally trapping three miners, the remains of which are yet to be recovered from the site. The disaster resulted in Vantage going into business rescue, a process that is being managed by Rob Devereux, a BRP and chartered accountant employed at Strategic Turnaround Solutions or STURNS as it refers to itself on its website. According to SSC statement on January 24, the task of saving the mines is being foiled by Devereux – an allegation that Devereux today refuted. Devereux’s contention is that SSC has not delivered cash required to re-open the mine either Lily or Barbrook, both of which are on care and maintenance and are now prey to the activities of zama-zamas, the name for illegal miners who are infamous in South Africa’s mining sector for stripping mothballed assets bare. In a hard-hitting media release, SCC’s Fred Arendse claims the transfer of Vantage Goldfields’ assets to his company would represent a historical and transformational event … whereby control of the company will for the first time change to black ownership. “I believe it is for this very reason that this company has been subjected to so many attacks, sabotage and interferences,” he said. In December, the transfer of the controlling interests in Vantage Goldfields to SSC were approved by the Department of Mineral Resources, but there’s been no progress legally in terms of which, in essence, SSC would be handed the keys to the mines. There also seems to be pressure at SSC. It said in its release that since the DMR’s approval for the transfer of ownership “… we have been engaging with the Industrial Development Corporation (IDC) to review the initial conditions of the funding structure and consider the robustness of the revised business plan,” said Arendse. Arendse said in August that the anticipated working capital required to operationalise the mines in the complex and associated infrastructure was about R46.2m. A further R250m is required to bring the operations out of business rescue of which R190m is being funded by the IDC. SSC, a privately-owned business with major ambitions, is not accustomed to taking on significant debt; therefore, delays add to the business pressure. Devereux said SSC hadn’t delivered into its part of the bargain. “You need cash to reopen mines and it’s not been paid,” he said. “The IDC loan has a skin-in-the-game condition and that capital won’t be forthcoming until SSC pays R50m. So far, it hasn’t,” he said. Arendse said Devereux had failed to disclose information regarding the value of tailings storage facilities (TSF) at the mines, an allegation which gives him call not to recognise the BRP. “Devereux also failed to timeously disclose significant TSF mineral assets of the company to SSC and the IDC with an estimated revenue potential of R550m over three year period. “If Devereux implemented this TSF project three years ago, the business rescue process would have been at an advanced stage; creditors’ businesses would have been saved; and a lot of peoples’ livelihoods would have been saved by them. “These mines have literally been ‘captured’ for three years by the BRP. Furthermore, it is my firm belief that the BRP does not care about the stakeholders, including all ex-employees and communities and his and his friends’ ultimate aim is to see these mines liquidated for their benefit,” he said. Said Devereux: “I brought in a co-practitioner eight months ago to assist but there has been no progress there either. “SSC does not have the support of the creditors. I have the support of the creditors. If he (Arendse) wants me removed, he must go to the court and do it”. Sound more like sour grapes to me. Cannot imagine a BRP purposefully sabotaging a project. Suggest one have a fine look at the sale agreement and the conditions precedent before taking sides. Hi Steve – I’ll update when I get word from the BRP. On the other hand there is this very thin thread, where mine going into business rescue they never get out. Pamodzi/Aurora, Blyvoor, Optimum, now this one. If you look at the astronomical sums of money these BRP’s get paid. Some serious questions need to be asked. Beauty of this one is that the practitioner has not been paid anything at all!!! Why don’t he and finalise the deal and stop looking for a scapegoat? The TSF is an asset of Vantage. SSC’s claimed expertise in mining would easily had ID’d this as a profit centre during its so called DD as would the IDC if it had bothered to conduct any diligence at all, besides it is public source material on Sturn’s website. Sturns is also hiding behind the shorfalls in the Act which allow him to remain on irrespective of time gone by and lack of performance. In Liquidation, he becomes a preferential creditor and a liquidator will take his 10%, so SSC is wrong there. However, while all this is going on, illegal mining will continue to expand and so too smuggling which is prolific in the Swaziland Moz border. The big issue is the IDC loan where the BRP will be paid 2,5% commission and various other outsretched hands will dip in too. The IDC needs to be put on the line as this is just another find a deal, make sure it is large and then we will all take our percentage cut …..then walk away. The state will carry the cost as in Independent media, Ayo technology etc, etc.